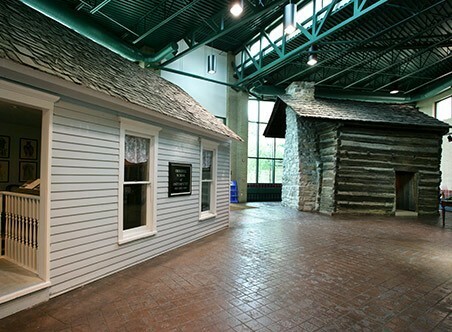 This large space features two of the Museum’s largest artifacts—the Still Family Cabin and the First School Building of the American School of Osteopathy (ASO). Both contain photographs, and artifacts that respectively present interpretive glimpses into the Still family’s frontier life and the earliest years of the ASO. The cabin, built in Lee County, Virginia in the 1820s, and the two-room ASO building, used from 1892-94, were both moved to their present location in 1994 as tangible reminders that Kirksville is the birthplace of the osteopathic profession.